Hungry Shark World tips for success are many, but let us focus on the most important things, shall we? Without much ado, below is a brief roundup of the Hungry Shark World tips that might make a difference in how fast you get to the bigger and the badder shark of your dreams. With all the bloody rush it’s easy to overlook the missions, but you need them if you want to collect a lot of gold fast. Make sure to complete the missions, which are normally three, and once you complete one a subsequent gets unlocked. There is nothing extraordinary here – beat X score, X distance, survive X time, eat X fish of this or that kind. Missions are important in a way they give you a general idea of where you need to be feeding. Deep diving to grasp in the beauties of the underworld is nice, but you don’t have time for this because of Health. Collect the chests. There are five per day, and give you a significant allowance you will need to unlock the power-ups, party fish and bigger sharks. Health matters, right? When your shark is starving, steer well clear of places where it can get shot or harpooned. Because if it’s just hungry deep diving, you can find a school of fish and subsist on it for a few seconds more till you find someone more substantial. On the other hand, if your shark is starving and gets wounded at the same time, it’s belly up. If you see schooling of fish, try to catch them all – it gives you shoal bonus, gold rush points, and a score multiplier. This is easier achieved when you have a companion shark, which is a predator. Upgrade your shark’s stats to give it more health, which in its turn leads to higher scores. It will be able to prey on other large fish and complete some missions easier. Don’t hunt sharks that are bigger than yours – it’s pointless. Do not hesitate to escape before it’s too late. I was able, however, to tear apart a whale once, but it looked wounded already, so the safest tactic would be to escape the predators larger than you. Do not eat toxic waste – it’s neon green and there is generally lots of trash floating around it. It will make your shark sick. So will the jelly fish, which are poisonous at least for the smaller sharks. Later on when you unlock bigger sharks they will be able to eat them. Or else, you can buy a companion baby octopus that is very good at eating jelly fish. I think I feel my stomach revolting. Not all areas are accessible for smaller size sharks. Sometimes you won’t be able to access them until you return with a larger shark. If you’ve been wondering what the heck is HUNGRY letters, Pocketmeta has you covered. There are six of them, obviously, H-U-N-G-R-Y. They are randomly positioned in each level, so looking for their locations in cheats is a waste of time. However, they’re very well worth the dig because they give you gold and points. If you really-really want to dig the hungry letters, upgrade your map. Upgrading your map requires the map itself, so you will need to unlock a map before upgrading. This may not be self-evident after you’ve bought the map for coins, but Upgrading it will display the location of the perks and goodies, such as the treasure chests as well as the hungry letters. Ever wondered what was wrong with the people and fish occasionally turning gold? This is not a glitch – you have entered the GOLD RUSH mode. With each earned point the gold rush bar at the bottom of the screen fills up. Important: when you see you are about to enter the gold rush mode, head straight to where the people and fat fish are because in the gold rush many of them will turn into gold. More coins for you then. 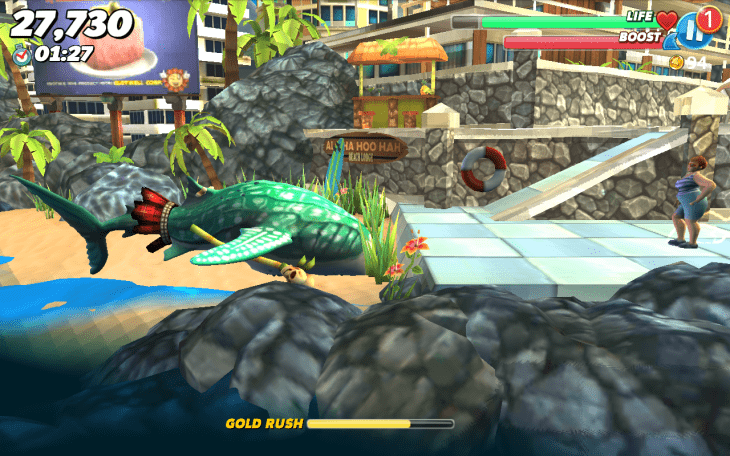 Gold Rush also comes with an infinite boost, so you can jump on and off the beach and munch on the tourists. 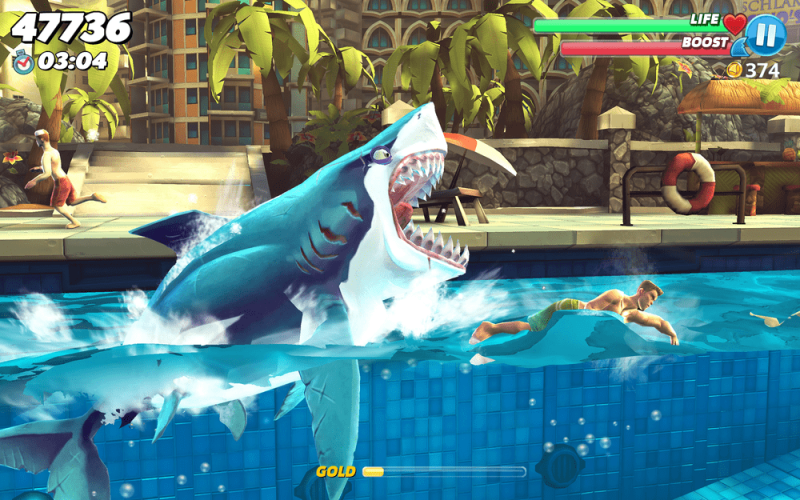 Your shark is also temporarily invincible during the gold rush. While we’re at it, there is another bar called Mega Gold Rush, which fills with every gold rush you trigger. This Mega Gold Rush is the reason I was able to eat a larger whale – because Mega Gold Rush makes the bigger fish (and mammals, obviously) turn red and edible. Unlocking new locations may not be a self-explanatory process, but you will see what the game wants of you when you bump into a locked location you wish to play, such as Arctic Ocean and Arabian Sea, the latter being the hardest of all. So, do not despair – you will need a really powerful shark to dive into those Arab waters. Each location displays a required set of sharks in specific tiers you need to unlock in order to unlock the new location. Tap a locked level on the map of the world, and look to your right – there is a tab that displays how many sharks you need to unlock and upgrade before the next location becomes available. Hunt the purple fish – these give you gems. Tear down water bikes and submarines to get gems, too. Sometimes, daily chests have gems, too. Do not waste gems to keep on playing unless you have 4-5 hungry letters collected. Better keep the gems for in-game purchases. Watch ads religiously to get the gems. You can just head over to the Shop and scroll down to the Free Stuff option, which will let you watch video ads in exchange for the in-game currency. Grind those ads, hail Ubisoft. Accessories – choose the ones that actually help you boost your health, or give you food bonus, or protect you from the poisonous jelly fish. By all means save the gold to unlock and later upgrade the laser, which stuns the nearby prey, so they don’t escape or fight back. A power field will keep your shark invincible for longer. But before you invest in companions and accessories, pump up your shark’s stats to the max. Use boost to jump onto platforms, shore, crawl on your belly to get to the people in the oil station and don’t be afraid to get deeper into the shore line as long as you keep eating. Finally, eat, and be the shark! Good luck playing! 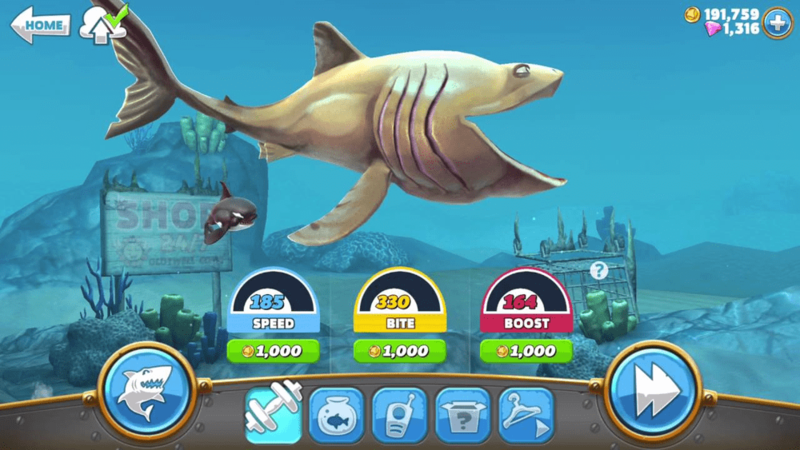 What are your Hungry Shark World tips and tricks? Share them in the comments below, and don’t forget to follow PocketMeta for mobile guides, tips, roundups and apps and games reviews.